I'm not a bug kinda gal. I have real issues with the ones with wings, but really, I'm not much a fan of any creepy crawlies, which explains why I have plenty of bug spray on hand. Knowing this,my fascination for the Insect Lore Ant Hill came as a huge surprise to me and to anyone who knows me. First we got the ant hill in the mail and I was intriegued by its shape. Instead of a flat, tall, skinny "traditional" type ant farm, this is a half dome - much smarter construction and considerably more stable than what I had expected. We read all the documentation and carefully clipped out the little section of the manual that needed to be sent back in order to receive the ants. I slipped the paper and a small check into an envelope and smiled. I felt like a kid sending away for a prize featured on the back of an Archie comic. My first gut reaction - annoyance at the archaic system - gave way to that childish glee that I felt as a kid myself when I sent away for stuff. Of course, having to wait two weeks for my ants wasn't nearly as fun. How quickly I've gotten used to next day delivery! And then the ants came. Two little vials of ants, seriously ticked off about being stuck in little vials, with a note saying that they had to be put in their ant hill as quickly as possible. They arrived on a Tuesday evening in the middle of a crazy week filled with early mornings and late nights. For two days I passed the envelope filled with its increasingly frantic ants and felt nothing but guilt about jeopardizing the lives of bugs I would have felt zero qualm about killing had they shown up in my kitchen in any other way. Finally a quiet evening loomed and I brought the ant hill out of its box. The girls and I huddled around the instructions - which I clearly hadn't read carefully enough the first time around - and realized we should have set everything up as soon as we got the ant hill. I crossed my fingers and poured in the sand and required drops of water. Hours later, and I really mean hours later, we were all still huddled around the ant hill watching them do their thing. It's mesmerizing. There's no apparent rhyme or reason. Some ants take sand away, others bring it back. They climb over each other, shove each other out of the way, ignore each other. And yet, when we got up in the morning, a clear tunnel had been dug. Weeks later the ants are no less mesmerizing. The tunnels have changed and moved in no apparent pattern or for no apparent reason. We haven't figured out why they do what they do, but we are no less drawn to watching them be endlessly busy. - Set up the Ant Farm when you send away for your ants so the sand has time to settle. - When they say a corn nibblet amount of food, they really mean that little. The ants eat microscopic amounts and the rest goes moldy. Ew. - Ants seem to bury their dead. That's cool. And takes away the worry about wondering what to do with the dead ants. - You do have to open the ant hill every so often to give them fresh air. They love it. It makes them all perky. But they do try to escape, so ignoring them is not an option. - It's a lot less gross than you might think - as long as you don't think about the ants as, well, ants. Insect Lore wants you to discover ants up close and personal too! 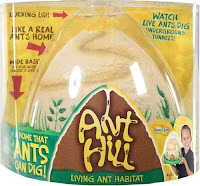 We're giving away two ant hills, one for the winner and one for the winner's child's classroom. To enter, simply leave a comment below telling me one thing you've done for your child that grossed you out or that you would never have done in any other circumstance. Visit the Insect Lore website and leave a comment letting me know what other cool buggy product catches your eye. Giveaway winner will be chosen on Sunday, Jan 9th at 10pm PST. This giveaway is now closed! Thank you to everyone who entered and tweeted it out! 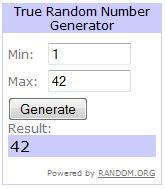 Congratulations to WWillows6, #42, winner of one Ant Hill for her family and one for her children's classroom!